by Chris Woodford. Last updated: October 20, 2018. It's hard to think of many things powerful enough to disrupt life across our entire planet. Huge natural disasters—like earthquakes, erupting volcanoes, or tsunamis (freak tidal waves)—can affect many thousands of people, but their impacts are usually confined to just one region of the world. Terrorist attacks cause worldwide panic and horror, but their effects are usually quite localized. Catastrophic nuclear accidents, like the one that happened at the Chernobyl nuclear plant in the Ukraine in 1986, can spread "fallout" (toxic radioactive debris) across an entire continent—but even they do not affect the whole Earth. Global warming, which is a gradual rising of Earth's temperature, is different from all these, representing a scale of threat greater than anything humans have faced in recent history. Unless we tackle the problem soon, it could transform the planet we live on, making the climate (Earth's weather patterns) much more erratic, forcing many species into extinction, and making life much harder—especially for people in developing countries. Photo: Is global warming too hot an issue for politicians to handle? This falsely colored image shows the amount of heat leaving different parts of Earth, as measured by NASA's Terra spacecraft. The blue areas are coldest, where thick clouds prevent heat from escaping. In the yellow areas, there is little cloud cover so the heat escaping is at a maximum. The red areas represent mostly ocean, where heat loss is midway between these two extremes. Picture courtesy of NASA Marshall Space Flight Center (NASA-MSFC). Imagine you live in a timber shack in Alaska. It's chilly up there, so you build yourself a huge log fire and pile on all the wood you can find. To start with, the fire seems a great idea—especially since it's so cold outside. The shack warms up slowly, but predictably, and it's soon pretty cosy. Since the shack is much warmer than the atmosphere and ground that surround it, it loses heat quite quickly. If the fire supplies heat at the same rate as the shack loses it, the shack stays at roughly the same temperature. But if you make the fire too big, the shack will get hotter... and hotter... and hotter. Before long, you'll start feeling uncomfortable. You might wish you'd never made the fire so big in the first place. But once it's burning, there's nothing you can do to stop it. The shack will keep getting hotter long after you stop piling wood on the fire. Photo: Getting warmer? 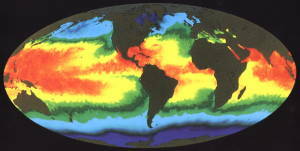 A NASA map of global sea surface temperatures produced using infrared measurements taken by a satellite in space. Red and yellow areas are hottest, green and blue are coldest. Picture courtesy of NASA on the Commons. Global warming is working a bit like this. Thanks to a variety of things that people do, Earth is getting slightly warmer year by year. It's not really warming up noticeably—at least not in the short term. In fact, since 1900, the whole planet has warmed up only by around 0.8 degrees Celsius. By the end of the 21st century, however, global warming is likely to cause an increase in Earth's temperature of around 2–5 degrees Celsius. There is a 75 percent chance of a 2–3 degree warming and a 50 percent chance of a 5 degree warming, and scientists agree that the warming is most likely to be around 3 degrees. Now even a 5-degree warming might not sound like much to worry about, but 5 degrees is roughly how much difference there is between the world as it is today and as it was during the last Ice Age. In other words, when we came out of the Ice Age, the planet warmed by 5 degrees over about 5000 years. Modern climate change threatens to produce the same amount of a warming in as little as a century! Once something as big as a planet starts to warm up, it's very hard to slow down the process—and almost impossible to stop it completely. Global warming means Big Trouble. Global warming is caused by a phenomenon known as the greenhouse effect. A greenhouse (or glasshouse) is good for growing things because it traps heat inside and stays hotter than the atmosphere around it. Earth's atmosphere behaves like a gigantic greenhouse, though it traps heat a different way. Gases high in the atmosphere, such as carbon dioxide and methane, behave like a giant piece of curved glass wrapped right round the planet. The Sun's rays (mostly visible light and short-wavelength, high-energy ultraviolet radiation) pass straight through this greenhouse gas and warm up Earth. 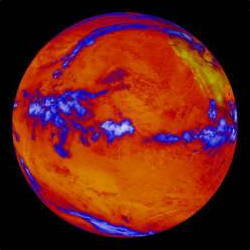 The warming planet gives off heat energy (longer wavelength infrared radiation), which radiates out toward space. Some of this outgoing radiation does not pass through the atmosphere, but is reflected back down to Earth, effectively trapping heat and keeping the planet about 33 degrees hotter than it would otherwise be. This is called the natural greenhouse effect and it's a good thing. Without it, Earth would be much too cold to support the huge diversity of life that it does. 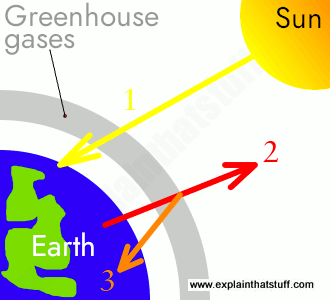 Artwork: The Greenhouse Effect: 1) When the Sun's radiation enters our atmosphere, it heats our planet. 2) Like all hot objects, Earth gives off some of its heat as radiation of its own. Some of this radiation passes straight through the atmosphere and disappears off into space. 3) However, some is reflected back again by the "blanket" of greenhouse gases in the atmosphere. The more greenhouse gases there are, the more heat is trapped and the hotter Earth becomes. The greenhouse effect would be nothing to worry about were it not for one important thing. Since the Industrial Revolution in the 18th and 19th centuries (when coal-burning steam engines were first used on a large scale), humans have been using energy in far greater quantities. Car engines, for example, which were invented in the mid-19th century, work by burning gasoline (petrol) with oxygen from the air to make heat in a chemical reaction called combustion. As a byproduct, combustion gives off (or "emits") invisible carbon dioxide gas (the gas our bodies breathe out). In a similar way, power plants use combustion to make our electricity—by burning fuels like coal, gas, and oil—so they give off carbon dioxide too. Most of the energy people use is made by burning these so-called fossil fuels—producing huge clouds of carbon dioxide, which are known as carbon dioxide emissions. The carbon dioxide drifts up into the atmosphere and makes Earth's greenhouse gas just a little thicker. This is called the enhanced greenhouse effect. As a result, more of the Sun's heat gets trapped inside the atmosphere and the planet warms up. To summarize: burning fossil fuels give off carbon dioxide, which increases the greenhouse effect and heats the planet—the process we call global warming. This is often described as an anthropogenic process, which simply means "humans caused it." Although a small minority of people dispute this, the overwhelming majority of the world's climate scientists believe that global warming is "very likely" caused by human greenhouse gas emissions. Photo: Warming Island: These photos taken from the USGS Landsat satellite in 1985, 2002, and 2005 show how a new island has appeared in Greenland following the melting of an arctic glacier. Melting glaciers are one indication that the world is warming up. Picture courtesy of US Geological Survey (USGS): Landsat. Thanks to all the fossil fuels we burn, there is now more carbon dioxide in the atmosphere than at any time in the last 420,000 years. However, the actual amount of carbon dioxide in the atmosphere is still relatively small. Before industrial times, it was about 280 parts per million (ppm). Today, it's around 380 ppm. That means if you had a chunk of atmosphere about as big as your bedroom, all the carbon dioxide in it would take up 380 millionths of the space—or roughly half the volume of a shoebox. Doesn't sound much to worry about, does it? But the important thing is that the amount of carbon dioxide is rising: in the last 150 years or so, humans have increased the carbon dioxide in the atmosphere by around a third—and that's a very big change for something as finely balanced as our planet. Most people have no idea how much carbon dioxide they generate each day. The Carbon for kids web page gives you some idea what your personal carbon dioxide emissions look like. The United States produces roughly 20 tonnes of carbon dioxide for each one of its citizens each year. Or to put it another way, that's enough carbon dioxide to cover the entire land surface of the United States 30 cm (1 ft) deep. Most of this gas winds up in the atmosphere and contributes to global warming. The problem is getting worse all the time. Currently, 80 percent of our energy comes from fossil fuels. 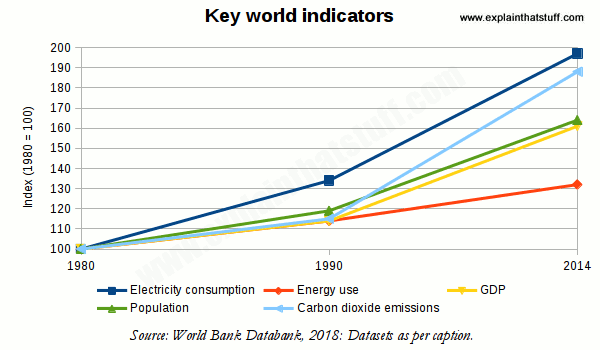 And the amount of energy people use is increasing too, not least because developing countries such as China and India are becoming more affluent. According to the US Energy Information Administration's 2017 forecast, world energy consumption will increase by 28 percent between 2015 and 2040 and over 75 percent of that energy will still be coming from fossil fuels. In summary, if things continue as they are, we'll soon be using nearly twice as much energy and still getting almost as much of it from fossil fuels. Without drastic action, the amount of carbon dioxide in the atmosphere will continue to increase—and Earth will continue to heat up. In other words, global warming will get worse. 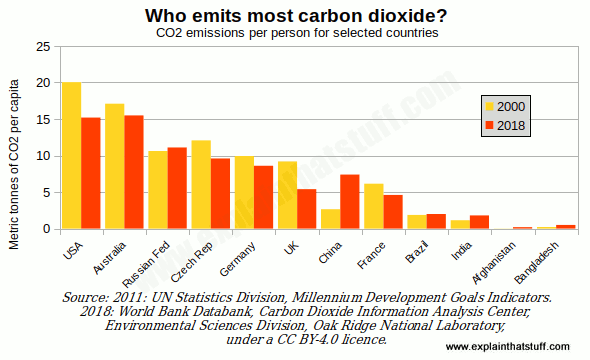 Chart: Who emits most carbon dioxide? This chart shows the per capita (per person) carbon dioxide emissions for a dozen representative countries. The yellow bars show emissions for 2000; the orange bars show the picture just over a decade later in 2011. You can see a clear trend: developed countries are slowly reducing their emissions; developing countries show emissions that are steadily rising (but still much lower per capita overall). At the time this page was last updated (February 2018), these remain the latest available figures from the United Nations Statistics Division: Millennium Development Goals Indicators website. Climate is the pattern of weather in a particular place: how much sunlight and rainfall it gets, how windy it is, and so on. The world's weather is entirely powered by the Sun. Since Earth rotates on a tilted axis, different parts of our planet are heated by different amounts at different times of year, making some regions hotter than others and causing the seasons. The temperature variations between one part of the world and another cause differences in air pressure, producing winds, storms, and even hurricanes. The Sun's heat also warms the seas unevenly, driving ocean currents—which, in some ways, are like underwater winds—from one place to another. Links between the atmosphere and the oceans can produce complex weather patterns such as El-Niño—a kind of abnormal and erratic weather that happens every few years in the Pacific. Scientists believe that greater amounts of carbon dioxide in the atmosphere, and hotter temperatures on Earth, will significantly change the climate across the whole planet. This climate change is already beginning to happen in parts of the world. If you live in a chilly place like Alaska or Greenland, you might think a bit of global warming sounds like a great idea. But climate change doesn't necessarily mean things will get hotter. Some places will be hotter some of the time, but most places will simply see more erratic and extreme weather. That could mean heavier rainfall on occasions, more snow in some places, longer periods of drought, more storms and hurricanes, and more frequent heatwaves. Photo: Will global warming bring more hurricanes?. 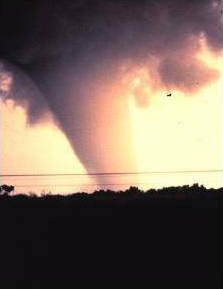 Picture courtesy of NOAA Photo Library, NOAA Central Library; OAR/ERL/National Severe Storms Laboratory (NSSL). Climate change is nothing new. Earth's climate has been changing regularly for hundreds of millions of years, sometimes getting colder and sometimes warmer. Everyone knows about Ice Ages—those periods of history when Earth was far colder than it is now. The climate change people talk about today seems to be different. Most scientists believe it is caused by systematic global warming, itself caused by a gradual increase in fossil fuels. Whereas traditional climate change makes Earth as a whole either hotter or cooler, modern climate change is going to make the climate much more erratic—hotter in some places, cooler in others; drier in some places; wetter elsewhere. In a nutshell, climate change means the type of weather we experience will change—perhaps quite dramatically in some places—as the years go by. "Warming of the climate system is unequivocal, and since the 1950s, many of the observed changes are unprecedented over decades to millennia. The atmosphere and ocean have warmed, the amounts of snow and ice have diminished, and sea level has risen." IPCC Climate Change 2014, Synthesis Report, p.2. Scientists have been debating this question for about 20 years now. So what's the official position? According to the Intergovernmental Panel on Climate Change (IPCC), which summarizes key scientific research on the issue carried out by thousands of scientists, greenhouse gases have "increased markedly as a result of human activities since 1750 and now far exceed pre-industrial values" and "most of the observed increase in global average temperatures since the mid-20th century is very likely due to [this]... It is likely that there has been significant anthropogenic [human-caused] warming over the past 50 years averaged over each continent (except Antarctica)." As one of the world's leading climate scientists, Stefan Rahmstorf of Potsdam Institute for Climate Impact Research, puts it, the current scientific view of global warming is: "based on decades of research and thousands of studies. The extraordinary consensus reached is seen in the statements of many international and national professional bodies which have extensively and critically assessed the scientific evidence." Since records of the weather date back only a hundred years or so, how can scientists confidently make claims that the climate has been changing over a much longer period? In turns out that Earth keeps a natural record of its own climate in many surprising ways. For example, as ice has formed year upon year at the poles, old ice has been buried underneath with bubbles of air trapped inside it. The bubbles act as a record of what the air was like on Earth when the ice formed—and thus what the climate was like in years gone by. Using drills, scientists can extract ice cores (long thin pipes full of ice), study the air bubbles at different depths, and calculate how much carbon dioxide they contain. If they figure out how old the ice is, they can use an ice core as a kind of graph of how carbon dioxide has changed over time. Scientists can also study changes in the climate using ocean sediments, samples of buried pollen, and other, once-living matter. Research like this can tell us what the climate was like hundreds of thousands of years ago. Although most scientists believe in global warming, it's important to note that a very small minority do not. Most agree that Earth is warming but not that fossil-fuel burning and human carbon dioxide emissions are responsible. The "climate-change skeptics" argue that increases in Earth's temperature are either not happening at all or may be caused by other things, including natural variations in the climate that have been happening for millennia. In recent years, however, fewer and fewer scientists have dissented from the widely held position that global warming and climate change are really happening. People could still be wrong about global warming—but that's becoming increasingly unlikely. This chart shows why the world is in trouble. Over the last few decades, the amount of energy people use (red line), their economic activity (yellow), the electricity they use (dark blue), the world's population (green), and their carbon dioxide emissions (light blue line) have all increased inexorably. Can the world continue to develop at such a pace without experiencing an environmental and social catastrophe? On the other hand, would reducing energy or electricity consumption cause major economic upheaval and social problems of a different kind? How can countries balance the need to develop economically with the need to protect the environment? How can scientists predict what will happen in future? If we know what's happened in the past, we can often figure out what will happen in the future. If you know it's rained every Tuesday for the last five years, you might hazard a guess that it will rain next Tuesday too—and you might well be right. Forecasting the weather is somewhat more complex than this, but it essentially means using data from the past to figure out the future. Forecasting Earth's climate—the long-term patterns of weather for the entire planet—is more complex still. Scientists make forecasts of the climate using what is known as a computer model. This is a large and very complex program running on a supercomputer (one of the world's most powerful computers). It's essentially a collection of math equations that describe how different parts of the climate work. Each equation contains variables (quantities that change) like temperature, rainfall, amount of carbon dioxide, and sea-level and shows how one of these things affects the others. Taken all together, the equations describe roughly how the climate works. How can the scientists be sure of that? They go through a process called "calibrating the model". If they start the model with data from 1900, say, and ask it to run forward 50 years, it should predict the weather in 1950. The scientists can compare the model's predictions with the real data for 1950 and see how the model fares. If it makes accurate predictions, they can run it forward into the future to see what will happen in 2050, 2100, or even later. The further into the future the model runs, the less accurate it is likely to be. One reason some people are skeptical about global warming is that they doubt computer models are good enough to model the climate decades into the future. To produce a computer model, scientists have to make certain assumptions about how the climate works. Since the climate is very complex and computers are only so powerful, these assumptions are usually simplifications. The skeptics are concerned that the computer models are too crude and simple and they may not reflect how things work in reality. But as time goes on, climate scientists have more and more data to work with, and computers become more and more powerful—so the models get better. You can read more about how modeling works in our main article on computer models. There's more about how scientists make computer models of the climate in a great BBC news article Models 'key to climate forecasts' by Dr Vicky Pope of the UK's Hadley Centre. 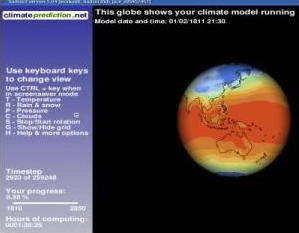 If you want to go one better, go to Climateprediction.net to run your own mini model of the climate. Using your computer's "down time", you'll be able to help some of the world's leading scientists produce even better models of our climate. Photo: The model I'm currently running for Climateprediction.net to help scientists improve their ideas about global warming. My computer is processing some data for the year 1811 as you read this! Over 47,000 computers in the world are tackling the project, which works just like SETI@home. What will be the impacts of climate change? As Earth warms up, the oceans warm up too—very slowly but significantly. Water expands as it warms so, as the oceans are heated, the water they contain takes up more volume, and this makes the level of the seas rise. The seas also rise when glaciers and ice sheets melt, feeding more water into the oceans. Sea-level rise is one of the major impacts of global warming. That might not worry you if you live in the center of a country or up on high ground—in Colorado or Montana, USA, for example, or in Birmingham, England. But if you live near sea level in Florida or California, in a country like Bangladesh, or on a low-lying island such as one of the Maldives in the Indian Ocean, there's a growing (but so far, still very slim) chance your home might disappear underwater. Currently, the world's sea levels are rising at 3cm (just over 1 inch) per decade. Scientists think sea levels could rise on average by anything from 10 cm to 1 m (4 in to 3 ft) by 2100. Another very obvious consequence of global warming is that the North and South Poles are warming dramatically. According to the Arctic Climate Impact Assessment (ACIA), sea ice in the Arctic has reduced by about 8 percent over the last 30 years—that means an area of ice the size of Norway, Sweden, and Denmark (or Texas and Arizona) combined has now disappeared. By 2100, the North Pole may be so warm that its ice disappears entirely in summer. Antarctica, at the South Pole, contains around 90 percent of the world's ice. Here, some glaciers are melting rapidly, draining water into the oceans and causing concerns about large-scale rises in sea-level. But the exact effect of climate change is complex: it is also leading to greater snowfall, which is building up glaciers in some places at the same time as they are being eroded elsewhere. If all of Antarctica's ice were to melt, it has been estimated that global sea levels would rise by 80 meters (260 ft)! Fortunately, that's not likely to happen. Melting Antarctic ice is contributing only about 15 percent of the rise in sea level that is currently underway. The ecosystems in different regions of our planet are finely balanced. In the polar regions, for example, plants and animals are adapted to living in extreme cold, with little sunlight, and hardly any rainfall. In the tropics, plants and animals are used to a much warmer and wetter climate. As global warming gathers pace, many parts of Earth will see their climate change significantly. The poles may become too warm for many of the creatures that live there. If the climate change happened slowly, things would have time to adapt: plants that like the cool could gradually shift northwards and grow at higher latitudes. But with a relatively rapid climate change, plants and animals may not be able to adapt quickly enough—and many will become extinct. Consider the Arctic, where average temperatures have risen twice as fast in recent years as for the rest of the world. Polar bears depend on sea ice for hunting and moving from one place to another. If all the summer sea ice disappears, as predicted, polar bears may be unable to survive. Hundreds of millions of migratory birds fly to the Arctic every summer to breed and nest. But global warming will alter the plants that can thrive in the Arctic. Around 50 percent of breeding habitats for some birds may disappear, threatening the species that depend on them. 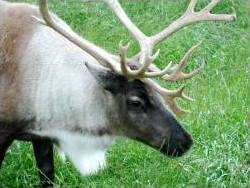 Caribou (reindeer) are already in decline in many places because their tundra habitats are starting to disappear. Photo: Are caribou really heading for extinction? Picture by Karen Laubenstein courtesy of US Fish & Wildlife Service. And it's not just the Arctic that will be affected: climate change will make life difficult for plants and animals all over the world. In the tropics, for example, warming oceans are expected to kill off parts of coral reefs, with disastrous effects on the complex, colorful ecosystems that depend on them. Some predictions say climate change could make 30–40 percent of the world's species extinct. What impact will climate change have on people? Humans, of course, are animals too—and, although we often forget it, we are also part of the complex global ecosystem. What's happening at the North Pole might seem remote and unimportant, but we are likely to feel the effects of climate change much closer to home. More erratic weather patterns could mean much greater storm damage and the loss of coastal areas to rising seas; the insurance industry has been worried about the effects of climate change for many years. Episodes of El-Niño are more intense and longer-lasting and already happening around three times more often than a century ago. Floods are likely to plague some countries, droughts others. On some predictions, climate change flooding could make around 100–200 million people permanently homeless by 2100. Ironically, even in a world of rising sea levels and often more severe rainfall, many more people are expected to suffer severe water shortages. There will be other impacts too. Changes in climate will make it easier to grow food in some places, but much harder in others. There may be gains in production in parts of the United States, but countries such as those in Africa are predicted to lose out. Overall, the world's poorest people are expected to be hit hardest. Pests and diseases are predicted to spread much further to take advantage of global warming. Mosquitoes, for example, breed faster in warmer climates, spreading diseases to more people. By 2100, in a warming world, malaria is expected to spread much more widely, placing two-thirds of the world's people at risk—compared to just 45 percent at risk today. 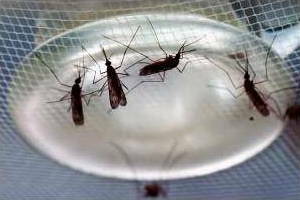 Photo: Mosquitoes are expected to extend their range north, putting more people at risk from malaria. Picture by National Institute of Allergy and Infectious Diseases (NIAID) courtesy of National Institutes of Health Image Gallery. The short answer is a simple one: to reduce the impact of climate change, we need to reduce global warming. That means producing fewer carbon dioxide emissions and it might mean using less energy or using it more efficiently (doing the same things with less energy or better technology). In practice, reducing emissions is both very simple and very hard. It's very simple for any one of us to reduce our personal carbon dioxide emissions. You can replace the incandescent lamps in your home (ones that make light by getting hot) and use energy-saving fluorescent lamps instead. You can switch your utility company so more of your electricity is made from renewable energy. Or you could bicycle, walk, or take the bus from time to time instead of using your car. You could put on a sweater instead of turning on the heating, open your windows instead of using the air-con, and drive with better fuel economy in mind. These things are all very easy to do and will make an immediate difference. But are they enough? 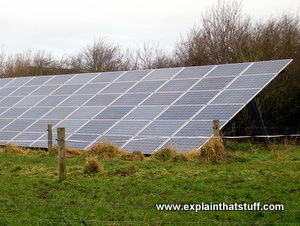 Photo: Solar panels like these could help us to tackle global warming by producing energy without emitting carbon dioxide. The real problem is that the global trends are working against us. Developing countries like India and China are becoming more affluent as people there escape from poverty. More people are buying cars and aspiring to the same kind of lifestyle that people enjoy in the United States and Europe. With global energy and fossil-fuel use still increasing, major climate change seems almost unavoidable. That doesn't mean we should give up trying to stop it. With a dramatic international effort, we might be able to halt the growth in carbon dioxide emissions by 2100. If we can keep carbon dioxide levels in the atmosphere to below 550 ppm (roughly twice what they were before the Industrial Revolution and about 45 percent higher than they are today), flooding caused by climate change in low-lying countries like Bangladesh will be reduced by as much as 80–90 percent. While it's easy for individuals to make a difference to global warming, governments are finding it much harder. One concern is that measures to reduce carbon dioxide emissions may mean using less energy and could harm economic growth. So if one country voluntarily tries to clean up its act, the fear is that it may find itself at an economic disadvantage to other nations. This is why the United States refused to support an international climate-change treaty called the Kyoto Protocol. The treaty excluded developing nations such as China—and the US government believed all countries should take part. All the time the world's governments continue to debate and disagree, global warming is getting steadily worse. The longer it takes to reach agreements, the worse things will get. In October 2006, the British government published a report by a distinguished economist called Sir Nicholas Stern. The Stern Report argued that it makes sense to invest money and tackle climate change now, because the cost of putting off action will be greater tomorrow. (It's rather like going to the dentist for a filling now to stop your teeth falling out later.) Stern claims global economic activity (measured by something called gross domestic product, or GDP) could fall by up to 20 percent if the effects of climate change are really severe. By contrast, investing in measures to stop climate change now would cost only one percent of GDP—20 times less. With the publication of the Stern report, scientists, economists, and politicians finally appeared to be talking the same language. Interestingly, some noted climate change skeptics have now reversed their position. Several years ago, Professor Richard Muller of the University of California at Berkeley was distinctly dubious about global warming, so he set up the Berkeley Earth Surface Temperature project to test the evidence fairly and with an open mind—just as you would expect a good scientist to do. By July 2012, he had announced in the New York Times a much stronger belief in human-caused climate change than even the official IPCC verdict: "Global warming [is] real... and humans are almost entirely the cause." Even so, governments have continued to dither and put off firm action. In December 2015, at an international summit in Paris, France (COP21), 195 nations finally agreed a deal to try to limit global temperature rises to less than 2°C. While the negotiators congratulated themselves on a momentous achievement, critics were quick to point out that little is changing: the world is still on course for a much higher temperature rise and potentially devastating climate change. One of the world's most influential climate scientists, James Hansen, described the Paris agreement as "a fraud... a fake... worthless words. There is no action, just promises. As long as fossil fuels appear to be the cheapest fuels out there, they will be continued to be burned." And temperatures will keep on rising. Each January since 2013, journalists have found themselves writing the same headline: measured one way or another, last year was "the hottest ever." In January 2017, scientists discovered that 2016 was the hottest year ever recorded; in January 2018, they revealed 2017 was the hottest year on record without an El Niño. Global warming means many more headlines like this in the future. At the end of 2018, the Intergovernmental Panel on Climate Change (IPCC) warned that we now have just 12 years to limit global warming to 1.5 degrees, which would "require rapid, far-reaching and unprecedented changes in all aspects of society." Even with all these warnings, there remains a distinct lack of urgency in tackling climate change. What will it take to make us wake up to global warming? And when we finally do, will it already be too late? NASA Temperature Data: 1880–2015: This is a quick, 30-second animation from NASA showing how global temperatures have changed since the Industrial Revolution. Global warming 101: A complete 3-minute intro to global warming from National Geographic on YouTube. Climate change: A slightly more complex, 10-minute video from the American Association for the Advancement of Science (AAAS) on YouTube. Climate Scientist Dr. Michael Oppenheimer on climate change: A 25-minute interview with one of the world's leading climate scientists, from The Alcove, on YouTube. NASA: Supercomputing the Climate: A short (6-minute) video that explains how computer models are used in climate science. What is climate change? : BBC News, October 4, 2017. How 2016 Became Earth's Hottest Year on Record by Jugal Patel. The New York Times, January 18, 2017. COP21 climate change summit reaches deal in Paris: BBC News, 13 December 2015. Short Answers to Hard Questions About Climate Change by Justin Gillis. The New York Times, published November 28, 2015, updated July 6, 2017. The top ten global warming 'skeptic' arguments answered by Dana Nuccitelli, The Guardian, 6 May 2014. Climate change study forces sceptical scientists to change minds by Leo Hickman, The Guardian, 29 July 2012. Humans blamed for climate change by Richard Black, BBC News, 2 February 2007. The Thinking Person's Guide to Climate Change by Robert Henson. American Meterological Society, 2014. (Also published in the UK and other countries as The Rough Guide to Climate Change, Rough Guides, 2011.) The best single-volume introduction to climate change I've seen. A very accessible book for adults and older teens. Global Warming: The Complete Briefing (Fifth Edition) by John Houghton. Cambridge University Press, 2015. A good, no-nonsense introduction to the science. It's less accessible than Henson's book, but still an easy read. Climate Change: Turning up the Heat by A. Barrie Pittock. Routledge, 2017. Another excellent choice if you're looking for a one-volume introduction to the topic. High Tide: Notes from a Warming World by Mark Lynas. HarperCollins, 2005. What impact is climate change having already? Six Degrees by Mark Lynas. Random House, 2008. Explores how the planet will change as it warms up, degree by degree. This Changes Everything: Capitalism Vs. The Climate by Naomi Klein. Simon and Schuster, 2014. Klein argues that climate change requires nothing less than rethinking our entire economic system. Heat: How to stop the planet burning by George Monbiot. Allen Lane, 2006. A melodramatic title? A powerful book about turning climate change around. Boiling Point: How Politicians, Big Oil and Coal, Journalists, and Activists Have Fueled a Climate Crisis by Ross Gelbspan. Basic Books, 2008. The politics of climate change and its skeptics. Gelbspan's earlier book The Heat Is On: The Climate Crisis, the Cover-up, the Prescription, Perseus Books, 1998, is also worth a look. Eyewitness: Climate Change by John Woodward. Dorling Kindersley, 2008: A clear and straightforward guide presented in easily-digestible, picture-story format. Earth Matters by Lynn Dicks et al. Dorling Kindersley, 2008: A colorful guide to the many challenges Earth faces in the coming years and decades, with a particular emphasis on climate change. I wrote the polar section of this book. Climate change fact sheet: A handy summary of key facts and data collected together by leading climate scientist Prof. Stefan Rahmstorf of Potsdam Institute for Climate Impact Research. IPCC: Climate Change 2014: Synthesis Report: At the time of writing, in early 2018, this remains the most comprehensive single-volume summary of the global scientific consensus about climate change. You can download the original 151-page report as a PDF (14 MB) or browse a user-friendly summary. UK Met Office: Climate Guide: A good collection of introductory guides and more detailed reports from the leading UK climate organization. The Guardian: Ultimate Climate Change FAQ: A huge collection of facts, resources, and news articles about climate change.